Silvia’s creations are born out of her two great passions: baking and modelling. The realization that the two could be combined to produce delicious and visually stunning cakes and desserts was, for Silvia, a eureka moment and she hasn’t looked back since. Initially self-taught, Silvia has since attended many specialized training courses to enhance her knowledge. This has given her the skills she needs to make her beautiful creations, always personalized in the unique style for which she has become world renowned. “Her cakes and characters tell stories in a truly original way”. 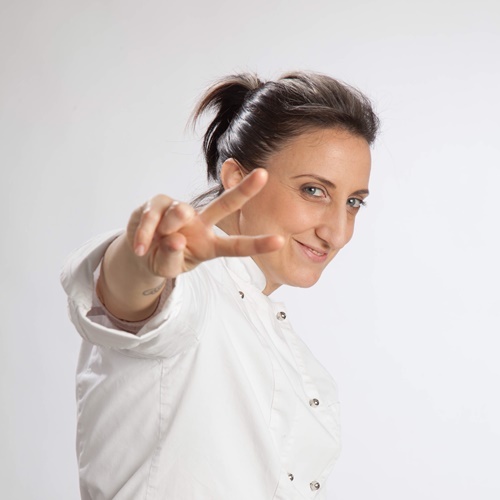 Winner of the Cake Masters Awards 2015 for Modeling Excellence, Silvia organizes individual and group training courses all over the world, participates in cake design events throughout Italy, and collaborates with ice-cream salons and patisseries as a consultant or lead designer in the decorative phase of production. In 2017, Silvia has designed and patented the first modeling tool of her line, Silvia Mancini Cake Art & Accessories: EASY EYES by SM. This unique range of modeling tools can be used to create in a quick and easy way different kind of eyes on sugar crafted figurines, nevertheless with modellling chocolate, cold porcelain, clay, marzipan and fimo.